Forces while in Silver Spring, Maryland. He served in the United States Marine Corps and in one year of service, he attained the rank of Private First Class. 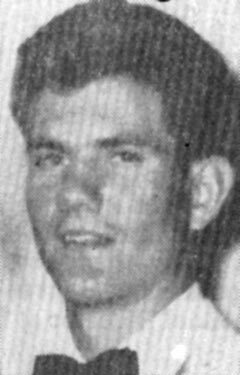 On September 22, 1967, at the age of 20, Frank Morris Streeks, Jr. perished in the service of our country in South Vietnam, Quang Tri. Marine Corps Private First Class Frank M. Streeks, Jr., 20, a native of the District of Columbia, was killed in action in Vietnam September 22. He was hit by enemy artillery fire during action near Quangtri. Private Streeks was the son of Mr. and Mrs. Frank M. Streeks Sr. of 1710 Brisbane St., Silver Spring, Maryland. A 1965 graduate of Northwood High School, he enlisted last year after attending Montgomery Junior College for a year. He had been in Vietnam for six months. He was a member of St. John the Evangelist Church, Silver Spring. Besides his parents he leaves a sister, Sandra Louise, and a brother, Michael J. of Chilium, Md. the "Trippy Award" in his honor since his death. Trippy's next door neighbor and another childhood friend, Johnny Liverman, was killed in action in Vietnam on 11 December 1968.